This is part two in a 3-post series on the Fifth Ape Fundamentals course I took with Colin. Here's part one, and here's the write-up of the first class I took from him. So I had this dream the other night. You know how sometimes you'll have a "flying" dream? Where suddenly, by some miraculous mechanism, you find yourself floating a few inches off the ground, then higher and higher and before you know it you're soaring, miles high. And it always feels so incredibly effortless and natural - you were born to fly, it couldn't be any other way! - that when you first wake up, the action of remaining tethered to the earth is the one that seems more unnatural. Well. I had a parkour dream. I can't remember all the details, but there was definitely some insane intrigue going on. At some point I had to chase someone through an airport terminal that was also somehow a grocery store. But that's not important. The important part is, while chasing this unremembered foe, I had to get myself over a lowish obstacle (I think it was a turnstile. yes I know there are not normally turnstiles in airports or grocery stores). And I vaulted. When I woke, everything else about the dream faded fairly quickly. But that feeling - of effortless almost-flight through no miracle but the work of my own body - has stuck with me. So it's in dedication to that awesomest of dreams (and in hopes of eventually making them reality) that I'm writing this now. This class covered sessions 3 and 4 of the course, and took place during two consecutive hours on a lovely sunny Sunday afternoon a few weeks ago, in the Forest Theatre in Chapel Hill. It was a good deal lower-key than the previous sessions - where the first two classes were a little intense physically, these focused much more on correct posture and positioning, and a little less on constant movement. After warming up (squats, push-ups and crawling. would you expect anything else?) we started to work on fighting form. 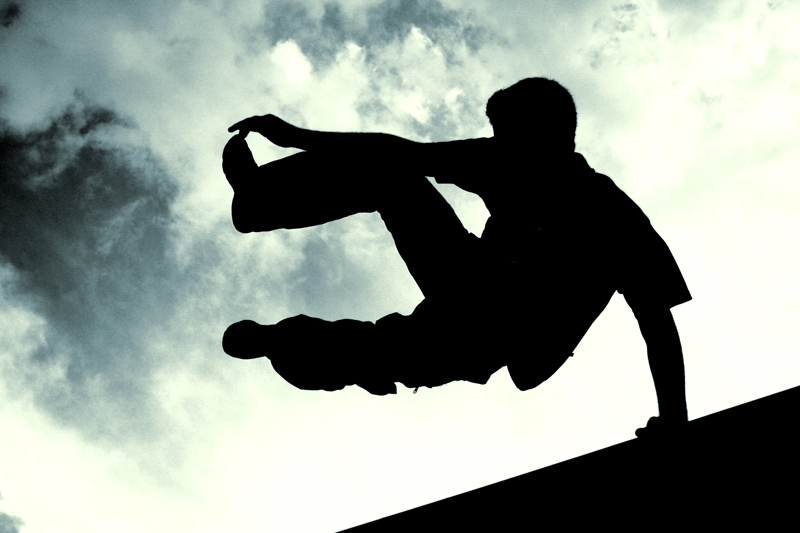 That might sound a little off-kilter for a parkour/natural movement class, but bear with me. As it turns out, everything flows together (surprise! ), and learning how to move when someone is throwing a punch at you is closely tied into the way you move when someone else, namely you, throws a wall at you by running towards it. It's all about efficiency of movement. Anything that's too grand a motion will just waste energy. You have to learn to expend just enough, no more. So proper fighting stance, the way Colin teaches it, differs slightly from my previous experience in martial arts, but the core is the same. Feet slightly staggered and not too close together, knees bent, pelvis tucked a little for stability, hands up protecting the face, chin down. That's the 3-second version. There's a ton of tiny little adjustments and things to focus on, and for a good while we just concentrated on getting the right form and getting into stance at short notice from a relaxed stance. Then we started to move around with it - staying in that stance and moving to the front, back and sides, then circling each other. The trick here is to keep your feet from crossing over each other - that makes you much less stable and thus more vulnerable to falling if you are pushed from that position. Falling, unless you're trying to do it, is generally bad. The more solid your position, the better off you are. Feet nicely loosened up, we then moved on to moving the rest of the body, still from, and always returning to, that basic posture. We started with blocks, which were vastly different from the way I was taught them before. My sensei's brand of jiu-jitsu was much more aggressive than the stuff Colin teaches, and less..."round," I guess. Less of a flow. Still very effective, but Colin's way is decidedly more gentle on the practitioner, and thereby a lot more sneaky, which is a very good thing. His blocks, relative to the ones I remember, are the tiniest of movements - barely even a shift in position. Instead of bringing your arm up and out and striking back at the other person as they try to hit you, you simply (for a blow to the head) slide your hand up and back, tucking your head into the crook of your arm and leaning in slightly, cushioning more than counter-attacking. Blows to lower on the body are handled the same way - tucking yourself in and cushioning the blow, with the smallest movement you can manage. Deflections, which we worked on next, are handled in much the same way: the smaller the movement you can make to get out of the way and push the attack off to the side, the more energy you have reserved for the eventual counter-attack. As we'd already gone over a lot of the other planned movements in the first class I took with him, Colin decided that this would make up the bulk of the day. So for a good long time, we just practised this: I'd try to maintain correct stance and respond to the attacks he'd throw my way; he'd just keep throwing (soft, non-serious) strikes. And I'm a little ashamed to admit it, but it was actually very difficult. The physical part wasn't too hard - this stuff is mainly muscle memory, so repetition will improve it, period - but I was surprised how taxing it was mentally. There's something very visceral about protecting yourself from a constant rain of blows, whether the severity is pretended and imagined, as here, or if it's real. All the switches are on full, and it can be a bit of an overload. More than a few times, I flinched and missed the block, then had to step back and apologise - it just gets to you, and brings out emotions and reactions that are usually hidden, even if you don't have much of a historical reason for that. And then Colin was all like "No, don't apologise! I am a bad person trying to hit you and you just LET me! Ha HA!" It is, however, much easier to hit someone else (with pads. actually hurting someone would be even more mentally painful), and that's what we did next. This didn't take too long - we just repeated a drill that went over deflecting a blow, then going in to clinch (read: capture) the opponent and start whacking him in the balls - er, pads - with knee strikes. It was pretty fun. After that we had some time left to work on rolling, falling and running - pretty much exactly what we went over in the first class I took with him. Except this time we ran not only on the road but also through the woods. On the gravel-covered path. It kind of hurt a whole freaking lot. Stay tuned for part 3, which will contain the actual vaulting! What superpowers do you have in your dreams or daydreams?